GIK collaborators often select PWNA as a partner because of its expertise in serving Native Americans. With a history of serving Native Americans for over 25 years, Partnership With Native Americans (PWNA) operates as a consistent, reliable resource for tribal communities in need and to organizations wanting to support them. 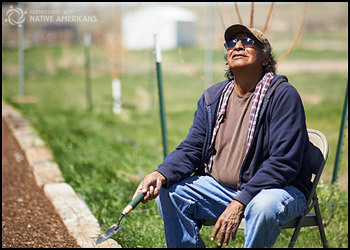 PWNA collaborates with reservation partners, corporations, foundations and other nonprofits to improve the lives of Native American Elders, families and children with the highest level of need in the United States. About half of PWNA support comes in the form of gift-in-kind (GIK) donations. GIK collaborators often select PWNA as a partner because of its expertise in serving Native Americans, reservation partnerships and strong distribution network. PWNA product donors also tend to be familiar with the disparities in Indian country. Like PWNA, they care about quality of life for Native Americans and respect their self-determined goals for their tribes. Throughout history, Native American communities have experienced one-sided treatment in the provision of supplies. PWNA is committed to providing high quality, useful products that its reservation partners request to enhance their programs or meet pressing needs in their communities. Nearly 90 percent of PWNA's reservation partners report they are more effective in meeting program goals for their communities with PWNA's support and services. 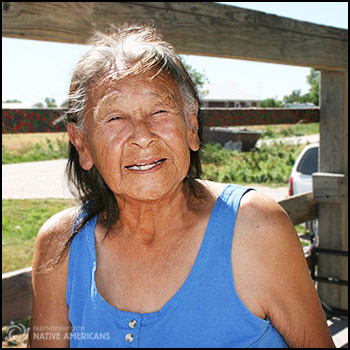 Arlene is an Elder of the Rosebud Sioux Tribe. 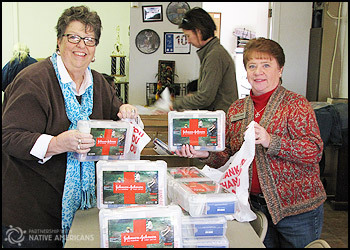 Each year, PWNA fulfills more than 5,000 requests for materials from reservation programs, trucking donated GIK products such as school supplies, personal hygiene items, hats, gloves and shoes to remote, isolated and impoverished reservation communities. With each delivery, PWNA ensures they are delivering the right products at the right time. PWNA products support Healthy Living and Community Events that take place in reservation communities and benefit 250,000 Native Americans annually. PWNA’s reservation partners use these products to encourage health and healthy lifestyles and increase participation in prevention activities. Recently, PWNA attended an Elderly Health Fair sponsored by its health partners of the Rosebud Sioux Tribe (RST) located in south-central South Dakota. Many organizations were on hand to offer health education specific to Elders’ needs. It was there that PWNA met Arlene, as she and other Rosebud Elders moved from booth to booth learning and then earning PWNA incentives for their participation. At age 64, Arlene was mainly interested in preventative healthcare. Sensiv was the right GIK product at the right time for Arlene. Each booth at the RST Elderly Health Fair was raising awareness about eyesight and dental issues, elder abuse, Veterans services, or other health and nutrition concerns. One long-time partner of PWNA, the RST Elderly Caregivers Program cheerfully gave each participant a bag of PWNA personal care items. Arlene was happy to receive the Sensiv toothpaste donated to PWNA by Medical Teams International. Unable to join in the meal with other Elders due to ill-fitted dentures and sensitive gums, she could only eat soft food. Although easily accessible to most Americans, Sensiv was not a product Arlene could run out and purchase on the reservation. For her, Sensiv was the right GIK product at the right time. 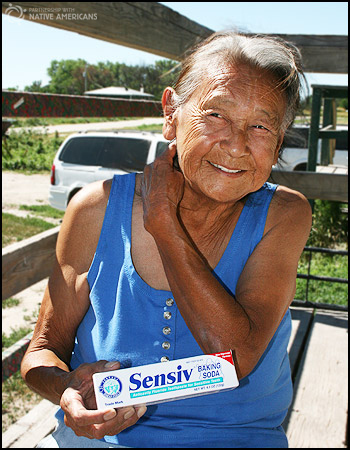 Oral health issues plague infants to Elders throughout Indian country. They run a particularly higher risk of dental disease and other challenges such as geographic isolation and budgetary restrictions. This is one of many such concerns faced by Native Americans with limited access to healthcare on the reservations. Through its distribution network and partnerships, PWNA transports aid to 60 remote reservations that most organizations cannot reach. PWNA relies solely on monetary and in-kind donations from corporations, foundations, nonprofit collaborators and individual donors to assist more than 1,000 reservation partners.